We chose furniture that unites the contemporary language to the existing at the beginning of the century, we added comfort and created an accommodation endowed with large dorms equipped with reading lights and individual storage, bright suites with television, spacious family rooms and common areas inviting. Here, our guests have fully equipped kitchen, bar, lounge and an attractive garden. We are situated in Republic Square, opposite the bucolic Garden Teófilo Braga, in the heart of downtown, 5 minutes from major points of interest. Right next to find the historic center, theaters, restaurants, bars, shops, etc. From here you can access all the best that Porto has to offer. Your reservation includes a municipal tourist tax. There is a tax exemption for any guest less than 13 years old, guests whose stays are motivated by medical treatments, provided they present proof of appointment / provision of medical services and guests with disabilities, that is, guests with disability equal to or greater than 60% , provided they present document proving this condition. The municipal tourist tax is due up to a maximum of 7 (seven) consecutive nights per person. Great place, beautiful accommodations and wonderful breakfest! Ótimo hostel! Limpo, tranquilo, seguro. Os funcionários são muito prestativos e gentis. O pequeno almoço ou café da manhã é muito bom. O local é próximo da estação trindade do metro, o que facilita muito. É próximo também da parte bem turística. Dá para ir a pé tranquilamente. Agradeço ao pessoal do hostel pela estadia. Super recomendo! Muito bom, hotel muito novo, funcionários muito atenciosos. Café da manhã bom, espaços comuns bons também. Adorei a estadia. Único ponto negativo é que achei um pouco longe do centro, no alto de uma grande subida. Gostaria mais de ter ficado um pouco mais ao sul. 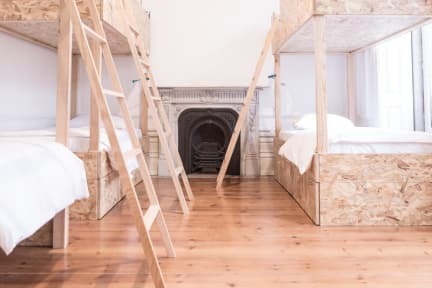 Mas o hostel em si é muito bom! Muito bem localizado, limpo e amplo! Espaço externo sensacional e acolhedor, além de possuir um ótimo café da manhã incluso.